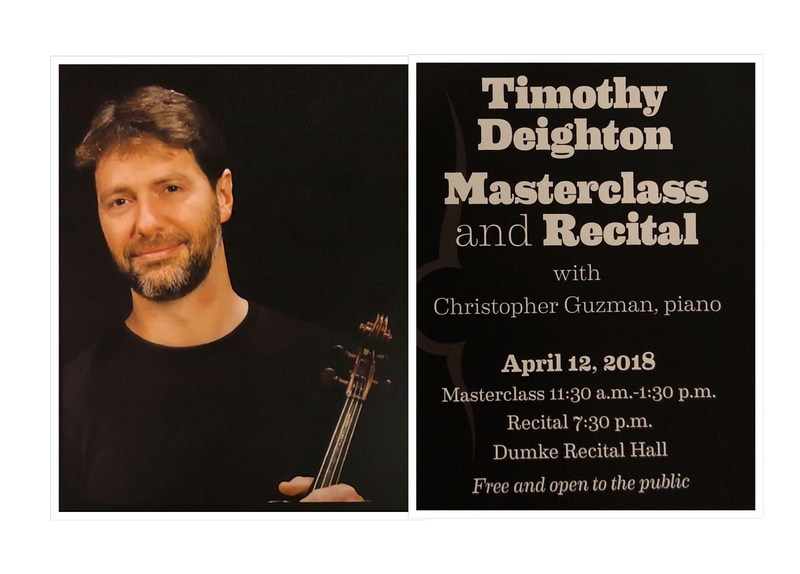 Upcoming visit from Timothy Deighton, Professor of Viola at Penn State University, April 12-13! We’re delighted to welcome our good friend, Timothy Deighton, back to Utah on April 12-13! Tim gave a memorable recital several years ago as the guest artist for the Primrose Memorial Recital at BYU. This time, he will present a recital at the University of Utah with Pianist Christoper Guzman, and give masterclasses in SLC at the University of Utah, and at Utah State University in Logan. Tim is a great violist and an imaginative teacher. You won’t want to miss this! The recital program will include Bach’s Gamba Sonata no. 3, Hindemith’s Sonata for Viola and Piano Op. 25 no. 4, and a transcription of Chopin’s Cello Sonata. Special thanks to the University of Utah Student Chamber Music Society for arranging this recital – hope to see you there!